Warm weather has arrived in the Triangle and weekend activities are picking up! Here are my top picks for things to check out the weekend of April 12-14. Have a top or suggestion for next week? Just drop me a line at TriangleExplorer@gmail.com. The people behind the large food truck rodeos scheduled for downtown Raleigh later this summer are holding a “Flash Mob Food Truck Rodeo” on Friday with a select number of trucks (Philly’s Cheese Steaks, Hibachi Xpress, Captain Ponchos Tacos, Loco Pops all confirmed) to help gain awareness for the larger 35 truck events that start-up May 12th. If you are looking for some great live music, you don’t need to look any further than Sola Coffee in North Raleigh. They typically have live local music each Friday and Saturday night starting at 7:30pm. This Friday Sola is host to the Reading Room Jazz Trio (piano, upright bass, drums & vocals) playing Classic Jazz standards, pop favorites. Do you want to be part of a growing movement, and enjoy a day of free activities with your family, friends and neighbors? Bike, walk, skate, dance and play in a traffic-free public space on West Weaver Street, closed to cars that day from 10 am to 2:00 pm. Activities on April 13 will include a rock climbing wall, a kids’ bike loop, beverages from the bike blender, games, booths, prizes and much more. Raffle tickets will be on sale for a chance to win a bike from Performance Bicycles. Like tasty treats, live music, beautiful art and action-packed exercise? The come celebrate the unveiling of Blue Cross and Blue Shield of North Carolina and the North Carolina Museum of Art’s (NCMA) Blue Loop – a mile-long trail in America’s largest museum art park. Celebration includes live bluegrass music, healthy treats from the Triangle’s favorite food trucks (Triangle Raw Foods, Loco Pops, Blue Sky Dining) and an inaugural walk around the loop. All attendees who walk the loop before 12:30 will get free admission to the NCMA’s “0 to 60” exhibit. 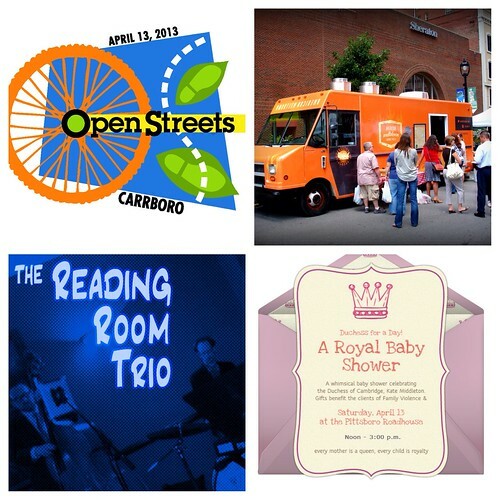 You are cordially invited to a Royal Baby Shower to benefit Pittsboro’s Family Violence & Crisis Services. You’ll enjoy a fun event with prizes, a “Fascinator” contest with several categories, tea and English finger foods prepared by Chef Greg Lewis, owner of the Pittsboro Roadhouse and Catering by Design. Your cost of entry? A wrapped gift for baby or new mom. Join NPR’s Frank Stasio as he moderates a panel including Only Burger’s Brian Bottger; Pie Pushers’ Becky Hacker; Monuts Donuts’ Lindsay Moriarty; and Ben Weber, who coordinates the Central Park Food Truck Rodeos. How did they get started? Has it turned out as expected? The panel will be followed by a question and answer session. Did you know every Friday at Jubala Village Coffee in North Raleigh is “Free Espresso Friday”? Every Friday they buy 10 lbs of a “guest” espresso and give out free shots of espresso until they run out. Jubala is one of my favorite Triangle Coffee Shops in the Triangle and a must visit for any coffee lover. It is located in Lafayette Village off Falls of Neuse Road in North Raleigh just South of I-540. See my post about Jubala from back in 2011 for pictures of the coffee shop. Don’t forget to try one of their awesome waffles!